With a hundred things to do this weekend, I thought at one point of skipping the movies and waiting until next week to see this film. Every time I saw a billboard, or poster or TV ad, I just could not wait. This is a film that calls for attention, it is about an important subject, and it is not afraid to wear it's heart on it's sleeve. Those are characteristics that compel me into a theater even when I don't have as much time as I'd like, and my instincts lead me in the right direction this weekend. 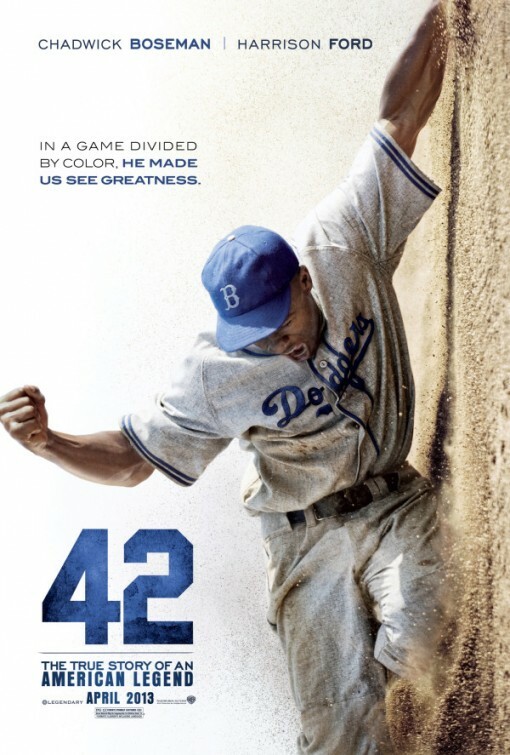 "42" is the kind of movie that cineastes often dislike but the public at large consumes in mass quantities. The story has few surprises, the film making is sometimes obvious or even down right schmaltzy, but it works on such an emotional level that minor quibbles about hamfisted story telling are swept aside by emotional performances and the personal baggage that the viewer brings to the experience. The story of Jackie Robinson, breaking into the major leagues, is a turning point in our cultural history. Years before anyone had heard of Rosa Parks, Martin Luther King Jr., or Brown vs. Board of Education, baseball became a pivotal moment in the Civil Rights movement. Robinson was on his own, standing up to the world as it was and simply asking to be allowed to play ball like any other person might expect to do. The movie focuses on the three years from when he was first considered as a candidate for the big leagues, to the end of his ultimately triumphant rookie season. This is a dramatic view of post war America, warts and all, struggling with itself as a moral leader in the world. I'd like to think that this film accurately reflects that struggle and allows us to take pride in the determination of a few men, black and white, who thought it was time for the world to change. The movie starts by visualizing the decision of Dodger President Branch Rickey, to seek out a black player for his team. It appears to be a calculated move, designed to build brand loyalty among the black fans of baseball, and the forward thinking Rickey seemed to know that it was destiny that the league would be integrated. As portrayed by Harrison Ford, Rickey is a combination of shewed business man and visionary civil rights advocate. He never comes out and acknowledges a motive other than building the best ball team he could, until an emotional scene when he confesses to having done less than he might have for another black player at another time. It's not a moment lingered over, but it does give us a little more motivation for all the trouble the decision ended up causing. Ford has always been an actor of great physicality. I think ninety percent of his one performance nominated for an Academy Award, is based on how he squares his shoulders, raises his arms, and smiles or grimaces for the screen. In this role he may have more lines than any part he has ever played, even when he has been the lead. It is still his physical behavior that imbues the part with it's life. Here his back is bent, and shoulders slumped. He chews his cigar with the same fervor that he is chewing the scenery. He gets the most possible out of his gravelly old man voice and lets the special make up effects that are his eyebrows in this movie sell the rest. He is not the lead, but he steals every scene he is in and the performance is grand. Chadwick Boseman is a bright young actor with a great future in front of him. He plays Robinson as a tightly wound spring, a man that has a strong desire to stand up and fight back, but due to circumstances he must bite his lip and keep his anger holstered. The story and it's emotional impact helps carry him through some rough patches. There are a few flat spots and a few over the top moments, but the actor manages to keep our focus on the story. The script sometimes requires a bit of the ridiculous, but that's the story of the country at the time. a giant in the world having to acknowledge the ridiculous racism that mars it's moment in the sun. Everyone else in the movie works very hard to show the kinds of people that were faced with these great changes. Some of them were brave, like "Pee Wee" Reese, who learns that his burden is nothing compared to Robinsons, others are cowards, backed reluctantly into playing with Robinson because their jobs were threatened. The most small minded of all are synthesized into two dramatic scenes. Alan Tudyk, portraying Phillies manager Ben Chapman personifies the deliberate hatred of the new, with a string of invective launched at Robinson during an early season game. Later, we see the contamination of an enthusiastic kid by the seeds of hatred planted by his father in the casual cat calling that went on during the season. I am a sentimentalist, and the tears come easily when Robinson is embraced by his team mate in a show not just of unity but of self definition. The baseball heroics are fine, sports films need those kind of moments, but it is the small, sometimes obvious moments that really get to me. Robinson was not always perfect, Rickey was not altruistic, and the whole country was not racist. Separating the good from the evil is not a pretty enterprise at times, but it is comforting to think that when push came to shove, most of the country was anxious to push forward. It will probably feel like hokum to some viewers, and the movie will be accused of the usual faults of a story like this is. If people can get over their racist past, you would think movie snobs could temper their bias and just enjoy a great, uplifting story without having to deconstruct it through a narrow sociological prism. I was deeply moved by the story and the production values make me long for the days when the world was coated in hope, and promise. Maybe the vision of the film is an illusion, but it is one that we should be entertained and inspired by. I always hope every movie is better than the last one, but I don't know if any poster this year will be better than the one for this movie shown here. Let's play ball. You and me both re: this film. Excellent review of it, Richard. Thanks for this. Thanks for coming by, I just found your comment right after stopping at your site. Enjoy Enter the Dragon. 42 is great and I love films that move me. I know absolutely nothing about baseball. Do you think someone like me would still get enough enjoyment out of this movie? The movie is only vaguely about the game, it is much more about the social change that is taking place. I don't think you would be overwhelmed by the game aspects at all. Thanks for the compliment and for coming by, I hope to hear from you again.